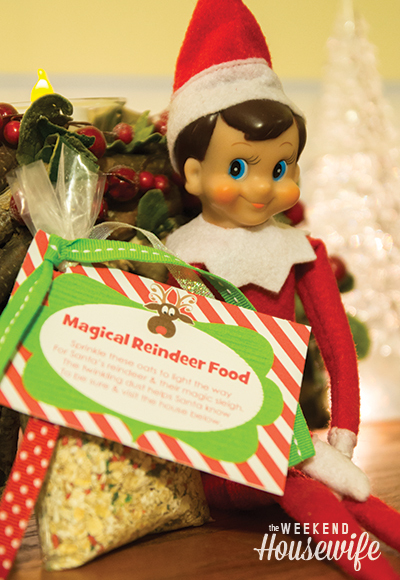 This was the 1st year that we have sprinkled Magic Reindeer Food on our front lawn (or in our case snow) and it couldn’t have been any easier to make! This was a last minute addition to our Elf on the Shelf because I didn’t think of it until the last minute. It was super easy to make too! I took some oatmeal, red & green sprinkles and sugar crystals and mixed them together in a large bowl. I guessed on the amounts that I used but I think it was about 1/2 cup of oatmeal and for the sprinkles and crystals, I just put some in until I thought there was enough. I poured them into a cellophane bag and tied with various ribbons. The tag that I used came from Amanda’s Parties. We sprinkled our Magic Reindeer Food on Christmas Eve and Shawn was super sleepy (we had gotten home from visiting family pretty late), so he wasn’t as excited about it as I thought he would be. However, I think that if it had been earlier in the day he would have enjoyed it more.